As someone who’s trying to grow out their natural hair while experiencing the least amount of setbacks, coloring my hair has been something I’ve repeatedly put on the backburner, in spite of how amazing it looks. Of course, there will be some minor hiccups here and there, but I want healthy hair above all else. And because my hair is naturally dry, I don’t want to encourage any damage or breakage due to dyes or bleaching. So when I discovered the viral Hair Paint Wax, I knew I had to try it; all of the fun of colored hair with no commitment or damage? Win-win. Hair Paint Wax comes in twelve colors, all of which have a relatively short ingredient list for a hair coloring product. I ordered the color Silver and the first ingredients listed on the container were water, carnauba wax, and beeswax. I was pleased to see that it was a water-based product and I didn’t have any complications or reactions to any of the ingredients. No harmful chemicals or bleach of any kind! Full list of ingredients: water, carnauba wax, beeswax, celearyl alcohol, licorice, glycyrrhiza, uralensis extract, tea extract, stearic acid, PVP/VA propionale copolymer, castor oil, ethoxylaated, titanium oxide. Applying the product is very simple, it’s applied directly to damp hair in “small to moderate” amounts, which may be more subjective depending on your hair length and thickness. I started off on freshly washed hair and I moisturized it well with my favorite products before applying the wax. I read that it was a bit drying and wanted to prevent my hair from becoming dry and stiff in the end. 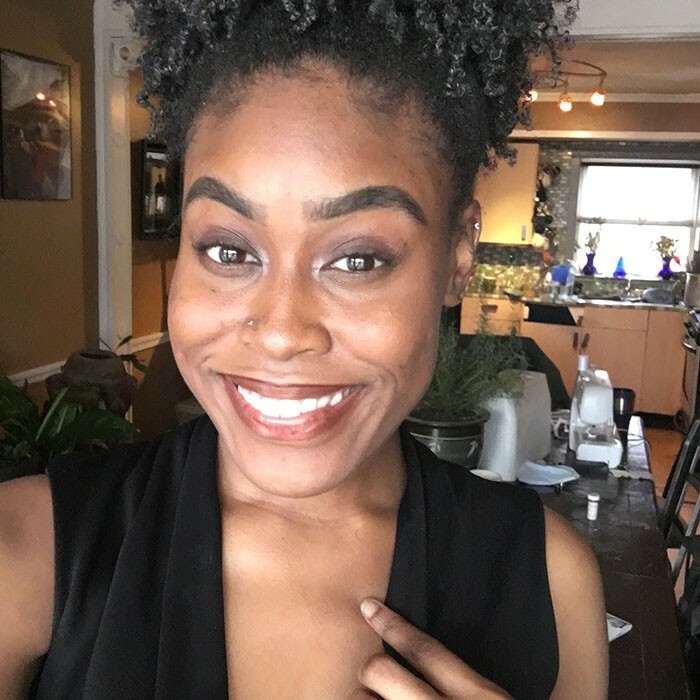 I used Shea Moisture’s Strengthen & Restore Leave-In Conditioner, Carol’s Daughter Mimosa Hair Honey Shine Pomade, and followed up with Jamaican black castor oil. I then separated my hair into more manageable sections to try to get an even application. One thing that impressed me was how well the wax can be incorporated with your daily styling routine, my normal products did not interfere with the color at all. When I initially applied the wax to my hair, it did feel a little drying at first which discouraged me from adding more (I was going for a vibrant color and it ended up being more of a tint). Because the color is buildable and my hair is dark as well as dense, I probably should have added more wax. By the time my hair was completely dry, my hair felt much better, with no excessive dryness. Unexpectedly, the wax even seemed to have a hold which made my curl pattern look a bit more defined. The only thing I did not enjoy while applying the product was the smell. To me, it smelled faintly of men’s deodorant? It wasn’t overpowering, but I definitely noticed it. I wore the wax in my hair for four days, and while it faded slightly, it really didn’t change much from the initial application considering it’s not a permanent dye. There is some noticeable transfer. As someone who is always fluffing their hair, I saw it more on my hands than anywhere else. I also tend to put water and oil in my hair everyday to refresh it until I moisturize it again, and everytime I pulled back silver-tinted hands. Fortunately, it does not stain, so any product that is transferred to your hands or clothing will wash off easily. Bottom line, do I recommend it? Yes, yes, and yes. Although I wasn’t 100% satisfied with my final results in reference to the color payoff, the overall product is well-made and very easy to work with. It’s worth a try for any natural who’s looking to try some fun colors without commitment and without permanent damage to their hair. I’ll definitely be revisiting the silver color and I plan on trying purple and blue in the near future. Hair Paint Wax ranges from $6.99 to $9.99, depending on the color. Have you tried Hair Paint Wax? Let us know in the comments! And take a look at some more gentle hair coloring options.